The Disney Netpal by ASUS is proof that someone can really design a netbook around kids. It's not the tiny profile, the Princess pink colors, or even the 10 customizable, Disney desktop themes that impresses me, but rather the software that comes bundled with it. The Disney Netpal by ASUS netbook is loaded with useful tools for kids and parents alike. 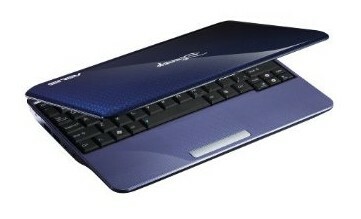 Asus updates its Eee PC line up with a Disney netbook. You know, for the kids! With the original Eee PC seemingly ideal for kids, it was only a matter of time before we saw more netbooks aimed specifically at children. The Asus Disney Netbook is a brightly coloured product – available in either Princess Pink or Magic Blue – with prominent Disney branding. Although the Asus Disney netbook may not offer anything new, it's a great machine for kids and is a surprisingly strong product for the money. After years of neglect from computer manufacturers, children have finally got a computer that's just for them. And what’s more, it stands up very well to comparison with versions aimed at adults. 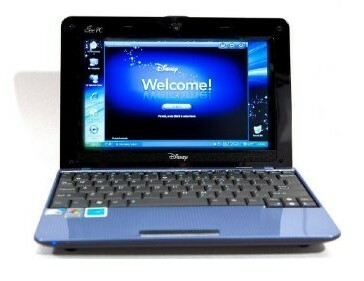 Asus’s Eee PC Disney (code name MK90) is designed to be usable by children ages 6 to 12 – and by their parents. Small, light, and robust, this Disney Eee PC is perfect as a child’s first computer. Parents can rest easy thanks to the secure parental control. We like the netbook’s quality matte LCD panel and finish. The biggest drawback is the somewhat short battery life. With this unit's great mix of specs, design, performance, and price, parents should consider the Disney Netpal if they're seeking a netbook for their children. It’s cheaper than buying a regular netbook and shelling out more cash for parental controls. And the Netpal’s design is more kid-friendly than other children’s netbooks we’ve seen. The more expensive, less-bold $599 PeeWee PC, with its robust parental controls and its age-targeted educational games, is intended for a slightly younger crowd than the Disney Netpal’s eight-to-12 demographic. We have to wonder, however, if the older end of the Netpal’s age range might be a bit too advanced for the Netpal’s kid-themed designs.